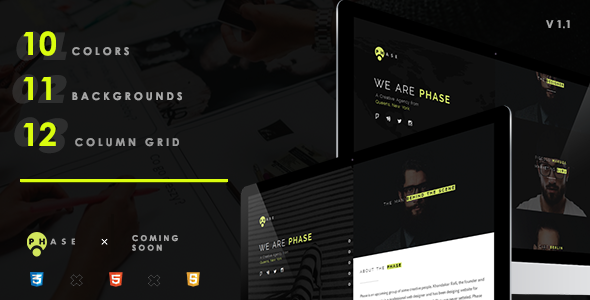 Phase is a beautifully designed HTML coming soon or under construction template suitable for any upcoming businesses, agencies, companies, teams, communities, charities, bands, movies etc. It’s built with custom 12 column grid system to make it perfectly responsive. The design is modern and eye candy. It’s simple yet packed with features and attracts the viewers with it’s visual design. Phase comes with 11 background versions. There are 5 Animated Backgrounds including Animated Gradient Background. There are also Image Background, Video Background, Pattern Background, Gradient Background, Slider Background and Solid Background. Super Responsive: Phase is a fully responsive template. It looks good on any device. With the custom responsive 12 column grid system, we ensured perfect display of the theme in all window sizes. 12 Column Grid: Custom 12 Column grid system makes the design perfectly responsive. It’ll look great on smaller or larger device. Creative Layout: The layout of this theme is pretty interesting. It’s divided into 3 columns. Only the column in the middle is scroll-able; other two are fixed. All the contents of the website is in the middle column. Clean Design and Code: The codes are completely valid and error free. It’s also really easy to understand and highly customizable. Retina Ready: The design of this template is pixel-perfect and just feels right. Images, animations and texts are coded with the highest quality of graphics. 11 Background Styles: You can also choose from 11 different backgrounds that can be customized the way you want. These are: 04 Animated Backgrounds including Animated Gradient Background. There are also Image Background, Video Background, Pattern Background, Gradient Background, Slider Background, Solid Background. Interactive Navigation: The navigation system of the template changes with the screen size and the background type. Fullscreen navigation is for smaller devices. Also the cool animated navigation icon will attract any viewers. 10 Color Themes: You’ll find 10 eye catching color themes inside the css folder in the main download file. Just replace the main style.css file with the color theme css file to change the theme. Animations: There are some eye catching custom css3 animations to make the user experience more smooth. Transitions and effects really catch the eye. 600+ Icons: Scalable vector icons that can instantly be customized. Size, color, drop shadow, and anything that can be done using fontawesome. Subscription Form: One click subscription form is also added in the template. Enjoy the ease of adding new subscribers. Working Contact Form: Validated contact form is available in this template. It includes minimal design, ease of use and validation.